This is a story, set mostly in Afghanistan, during the Second Afghan War. On an evening Dr John Watson returns to 221B Baker St to find that in his absence his former orderly, Murray has visited and left a package. Watson agrees to tell Holmes the story behind the items in the box.Watson tells what brought him to his plan to become an Army Surgeon, his education, his meeting with new friends and an early flirtation before going off to Afghanistan. 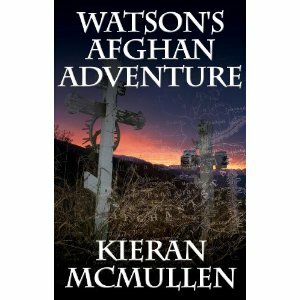 Watson explains to Holmes his experiences in battle with his new regiment, his search for a treasure and his final battle at Maiwand. Holmes is let in on the experiences that bring Watson to London and his new life assisting the great detective. This entry was posted in Afghanistan, Holmes, Uncategorized, Watson and tagged Afghanistan, Holmes, Watson. Bookmark the permalink.